Microwave Update (MUD) is an international conference dedicated to microwave equipment design, construction, and operation. It is focused on, but not limited to, amateur radio on the microwave bands. The North Texas Microwave Society would like to invite you to the annual Microwave Update Conference to be held October 3rd through the 5th 2019 at the Hilton Garden Inn and Conference Center in Lewisville (Dallas) Texas. Microwave Update is the premier microwave conference of the year and was initially started by Don Hilliard W0PW (sk) back in 1985. This is the ideal conference to meet fellow microwave enthusiasts and share ideas and techniques that will help you conquer your next microwave band. We have a full slate of speakers already set up including Rex Moncur VK7MO, Tony Emanuele K8ZR, Rick Fogle WA5TNY, Paul Wade W1GHZ, Joe Jurecka N5PYK, Doug Miller K6JEY, Greg McIntire AA5C, Steve Kostro N2CEI, Kent Britain WA5VJB, Bob Stricklin N5BRG, Barry Malowanchuk VE4MA, Tom Williams WA1MBA, Tom Apel K5TRA, Tom McDermott N5EG, Sam Jewell G4DDK, Dave Robinson G4FRE, Brian Thorson AF6NA, Skip Macaulay VE6BGT and Al Ward W5LUA. If you are interested in speaking, please let us know. Topics will include small dish EME, microwave propagation, parabolic dish feedhorn design and construction, SSPAs, circuit design, latest microwave devices, software defined radios, digital modes just to name a few. On Thursday afternoon, we plan to have a workshop lead by Tom McDermott N5EG on GNU Radio. GNU Radio is a development and simulation environment used to create and test software design radio applications. This is a powerful learning tool and GNU Radio can be used to implement working radio applications. See the Workshops section for details. Friday morning will be dedicated to a Test Equipment workshop with antenna gain measuring led by WA5VJB, noise figure testing led by W5LUA and phase noise analysis led by AF8Z and KC4YOE. We plan to have an informal program for the spouses which will include local shopping and sightseeing in the Lewisville, Grapevine and greater DFW area on both Friday and Saturday. 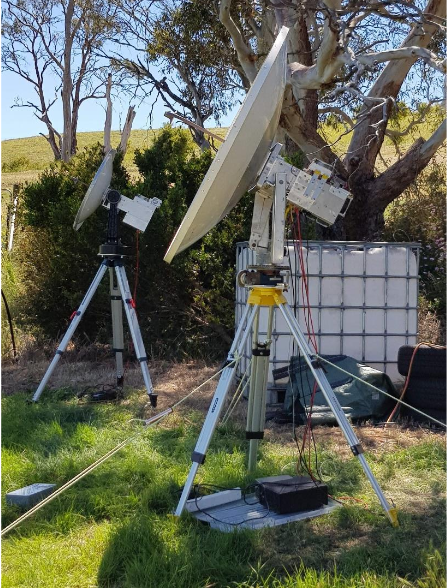 Our Saturday night banquet speaker will feature Rex Moncur VK7MO who has activated over 100 grid squares on 10 GHz EME in both Australia and New Zealand. Rex has also set numerous distance records on both EME and terrestrial using the various WSJT modes. Rex will show us some of the beautiful places he has visited and talk about his adventures to some of the more remote places down under. This should be a real treat for hams and spouses. Hope to see you in the Dallas area once again! Please book your hotel early, so we can make sure rooms are available for everyone. Late booking has been an issue at past MUDs, and we would like to have everyone at the same hotel. It's more fun for all. See the Hotel section for reservation information.